A scientist at the University of Vermont and four of his undergraduate students have discovered 15 new species of "smiley-faced" spiders—and named them after, among others, David Attenborough, Barack Obama, Michelle Obama, Leonardo DiCaprio, and Vermont Senator Bernie Sanders. You won't find them in Washington, DC, Hollywood, or Vermont—but on Caribbean islands and other southern spots you might now get a glimpse of Spintharus davidattenboroughi, S. barackobamai, S. michelleobamaae, and S. berniesandersi as well as S. davidbowiei and S. leonardodicaprioi. "This was an undergraduate research project," says Ingi Agnarsson, a spider expert and professor of biology at UVM who led the new study. "In naming these spiders, the students and I wanted to honor people who stood up for both human rights and warned about climate change—leaders and artists who promoted sensible approaches for a better world." The study was published September 26 in the Zoological Journal of the Linnean Society. 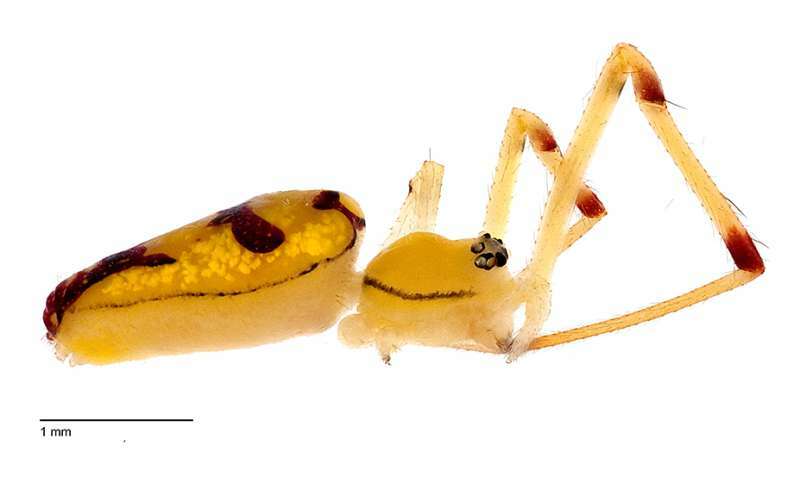 Until now, the beautiful, yellow, smiley-faced spiders in the genus Spintharus —named for a smiley face pattern on their abdomens—has been thought to have one widespread species "from northern North America down to northern Brazil," Agnarsson says. However, when a research team from the Caribbean Biogeography Project ("CarBio")—spearheaded by Agnarsson and Greta Binford at Lewis & Clark College—examined spiders from Jamaica, Cuba, the Dominican Republic, Puerto Rico, the Lesser Antilles, Florida, South Carolina, Costa Rica, Mexico, and Colombia—they discovered that one widespread species was actually many endemic species. Using CarBio genetic work, and the Vermont students' painstaking photography and lab work, the team—with support from the National Science Foundation—was able to identify and formally describe fifteen new species. "And if we keep looking, we're sure there are more," Agnarsson said. Each student who helped describe the spiders also got to name a few of them—and some were named for beloved family members, "but we all named the Bernie Sanders spider," says Lily Sargeant, one of the students who worked on the project, and who graduated from UVM last year. "We all have tremendous respect for Bernie. He presents a feeling of hope." "That spider species will be named after Bernie forever," says Ben Chomitz, another of the student researchers. "Our time on this earth is limited," says Lily Sargeant. "But I think that ideas are not that way. 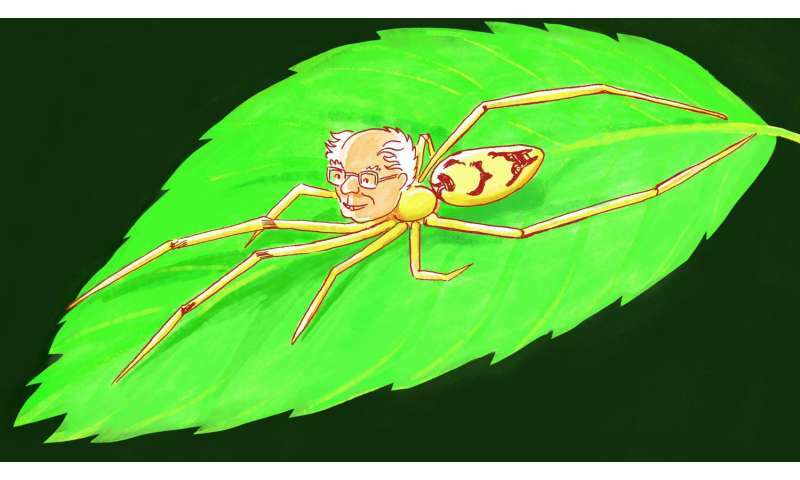 It is my hope that through naming that spider after Bernie we can remember the ideas that he has at this pivotal point in the life of our nation." For student Chloe Van Patten, her naming process goes back to what she calls a high school "obsession" with actor Leonardo DiCaprio. "I'm over my crush, but now that he's involved in environmental issues, I love him even more. So I named a spider after him hoping that if he read our study," says the recent UVM graduate, "he might go out to dinner with me and talk about climate change." The Caribbean region has long been known to scientists as a major global hotspot for biological diversity. The leading spider expert on the Spintharus genus in earlier decades, Herbert W. Levi (1921-2014), had concluded that differences he observed in these spiders across a wide swath of geography represented variation within one species. But newer molecular techniques deployed by the project's leaders, Agnarsson and Binford, show otherwise. "These are cryptic species," Agnarsson says. "As Dr. Levi's work clearly showed, they're hard to tell apart by looking at them." But the DNA data are clear: these spiders have not been interbreeding—exchanging genes—for millions of years. "All the sudden we have fifteen-fold increase in diversity in this particular group—just because we did a detailed study," says Agnarsson. "That tells us something about biodiversity in general. The more we look, the more we discover." Conservation biology, the team notes, fundamentally depends on good taxonomy, since preserving one widespread species is a radically different task than protecting the precise habitat of a genetically isolated, local species. The Vermont students saw their lab work in a broad cultural light. "I'm a second-generation American and I'm black," says Lily Sargeant. "It is through a diversity of perspectives that we achieve innovation in science and I appreciate how much the Obamas value diversity." "Here's the thing," says UVM scientist Ingi Agnarsson, "we need to understand and protect biodiversity in its many forms, and we felt compelled to recognize leaders that understand this."